Searching for hidden treasures at the flea market can be overwhelming. It’s hard to see the gems among the clutter of lawn furniture and old housewares. But if you train your eye, you can spot a diamond in the rough. A pair of garden gnomes would make handsome bookends in your library. A wooden ladder can lean up against a wall as a set of chic shelves. Just think outside the box and get creative! Flea markets are brimming with great items for your coffee table. A wooden toolbox tray makes a handy remote control corral in an Old West living room. A gilded framed mirror gets new life as a magazine tray on an ottoman in a swanky parlor. Does your place double as the neighborhood movie house? 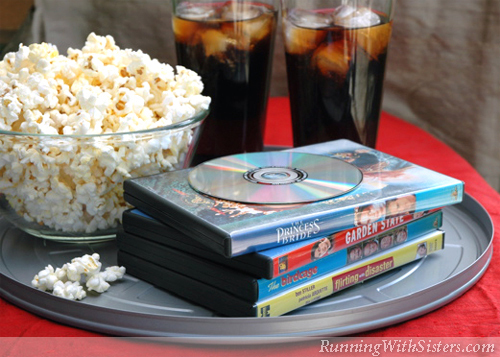 A film reel canister is set for re-release as a silver-screen serving tray. Just open it up and use the bottom half to serve picture-show perfect popcorn. For a double feature of fun, use the other half of the tray for dessert. That’s a wrap! Love flea market shopping but don’t want to spend a bundle? Don’t have a mansion to fill with a dozen Wurlitzer jukeboxes? Then consider decorating with small, inexpensive items like matchbooks, knitting needles, or political buttons. How to display these tiny treasures? Matchbooks look striking in a classic Ball jar. A collection of red and white fishing bobbers is a keeper in a goldfish bowl. 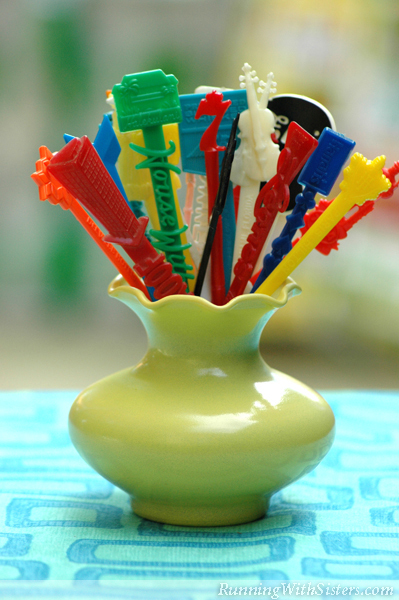 Vintage swizzle sticks become a bouquet with a twist when placed in a neat bud vase. Cheers to that! If your home office needs a major league do-over, throw that dull den a curveball with the help of a few nifty bargains. Nothing says springtime like baseball, so how about a bowl of balls for your home base? Toss them into a freshly spray-painted wire bowl (use red paint to match the stitching) and you’ve got a winner. Play ball! Practice some fund shui by keeping your bills out of sight till payday. 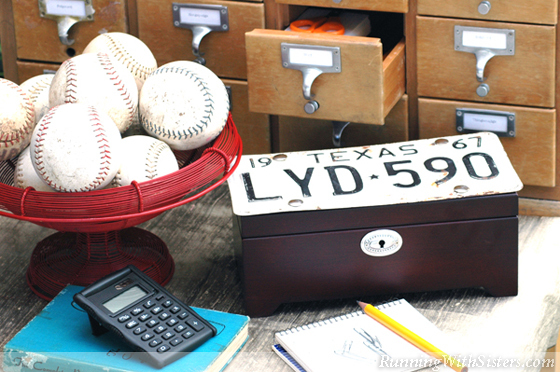 Try revving up an ordinary wooden box with an old license plate, a common flea market find. Add a few bolts to secure it to the top, and start your engines! Balancing your checkbook just got a license for fun. A cubbyhole cabinet, like a bank of post office boxes or a card catalog, is an organizing essential for the home office. Swap the Dewey Decimal System for whimsical labels like miscellany, this-n-that, and whatchamajigs. A little humor in the home office can make work more like play. And we could all use more of that! 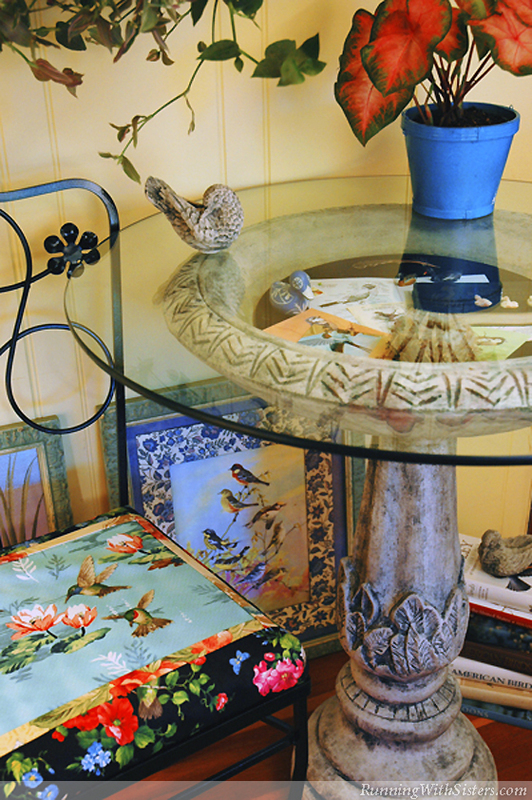 Bring spring inside by transforming an old birdbath into a charming entry hall table. With a quick clean up, a fabric lining, and a round piece of glass, you’ll have a shadowbox table that’s just ducky. What to put in a birdbath shadowbox? Something birdy, of course! How about a few ornithological postage stamps, miniature duck decoys, and a vintage pair of binoculars? A wrought iron garden chair beside the birdbath table will put you in the catbird seat. Finish the look with a framed page from a field guide and you’ll be sitting pretty. Cheap cheep!